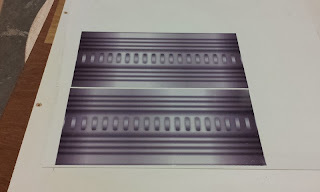 We had a couple of sign to cut for another few sign shops through the holidays as well. I'll post those in a bit. The current build is for another toy commercial. This pre-lights on the 8th, with the delivery happening on the 6th. They'll actually shoot it on the 9th of January. They want a Mars style surface for the toys. 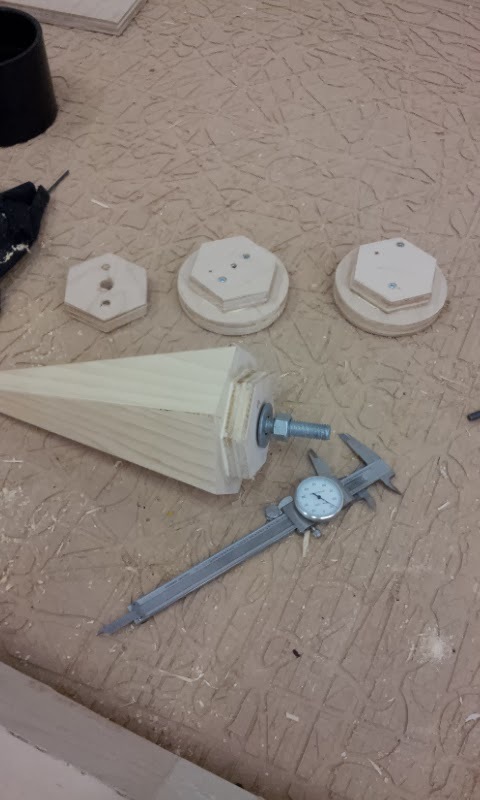 This build will be similar to the Batman and Dinosaur build we did in the summer. In fact, I think it's for the same people again. This is the layout sent by the Art Director. This was drawn in Sketch-up, and allows us to pull real world heights and measurements from the file. This makes building a lot easier! The middle section of terrain is around 20' wide. Most of the mountains and rock structures we will keep wild, this will let them move them around like martian Lego, depending on the lensing they go with. 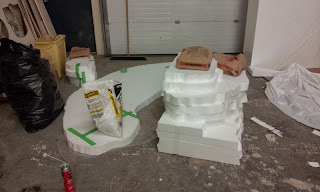 The bulk of this set will be styrofoam again, and this time I went with the lightest density at type 1. I also FINALLY picked up a hot-wire bow cutter. 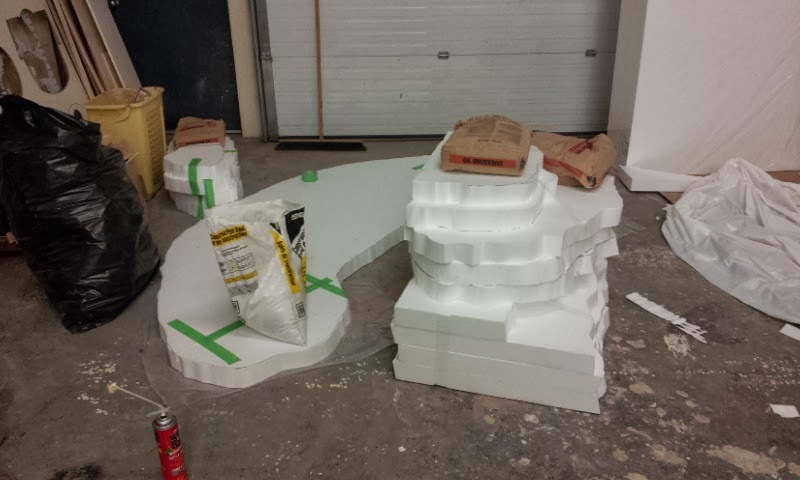 I'm hoping it will reduce the endless amounts of styrofoam balls that populate the shop for months after a job like this! 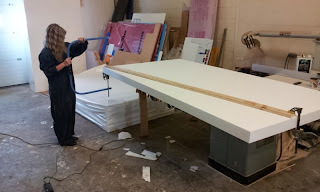 95 lb Jody (in a 200lb man set of coveralls HA HA) started the layout and cutting of the foam sheets. 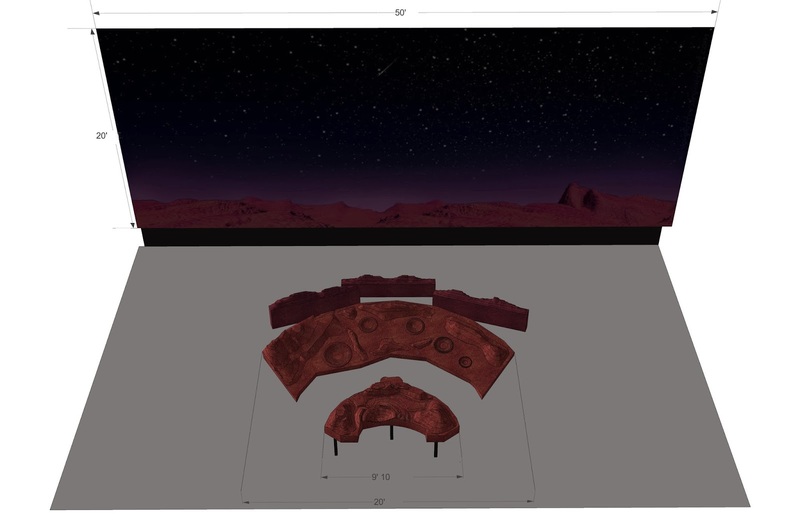 I imported the set drawings into Corel for dividing up into block sections for the rough cuts. The hotwire cutter worked amazingly quick and mess free. Although trying to cut and stay on the line is a bit like driving a bus drunk! With the rough cuts made, the sheets were glued up using spray foam, and a little tape to stop the foam from spreading the joints. 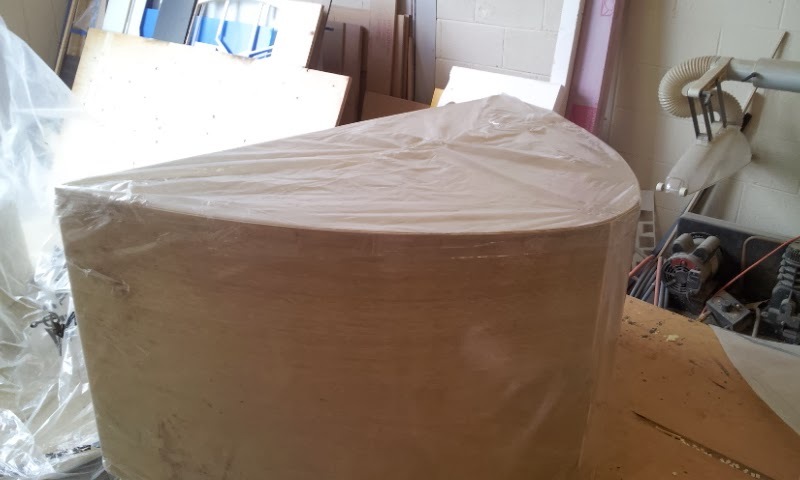 Using some strips of poly sheets to keep the sections from sticking to each other, we glued them together and stacked them all up. I only have two 50lb weights, so this let us keep all the sections flat till the glue dries. It may not look like much, but these are all the rock sections for the font base portion where the toy will be set up and shot. 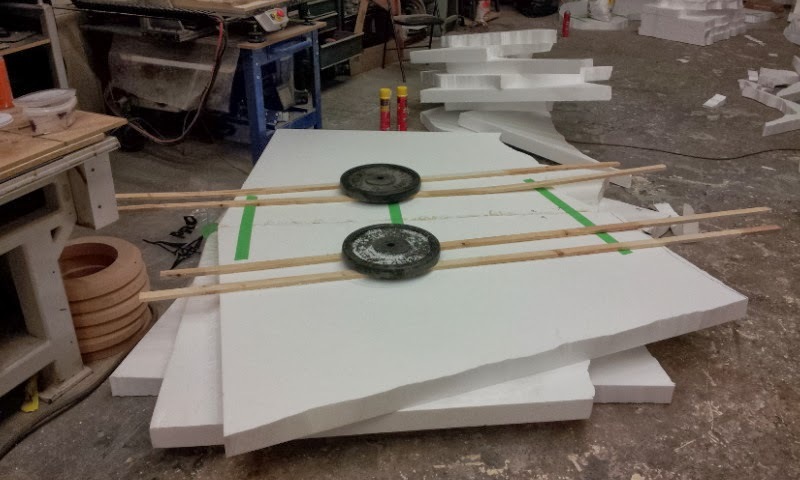 By the end of the day, we had 90% of all the foam cut and glued. I love our new hot-wire cutter! The last portion of the OLG lottery build was the painting. 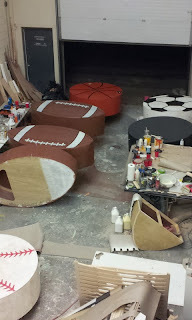 By the time the large "paper mache" forms were ready for paint, it was around midnight. It was a little stressfull, as we had to be on set with everything at 7am. This meant we would have to leave at 5:30 am at the latest! Not much sleep, that's for sure. 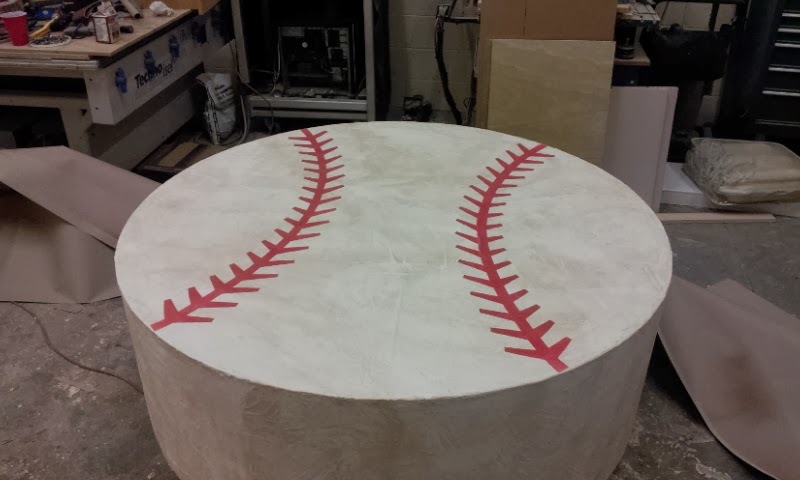 The look for these was to be totally handcrafted, so this meant hand painting. I vectorized the different sports balls, then sent the painted areas to our plotter to draw the masks, that we would cut out by hand. I didn't want to risk sticking adhesive vinyl on the newly painted surfaces. 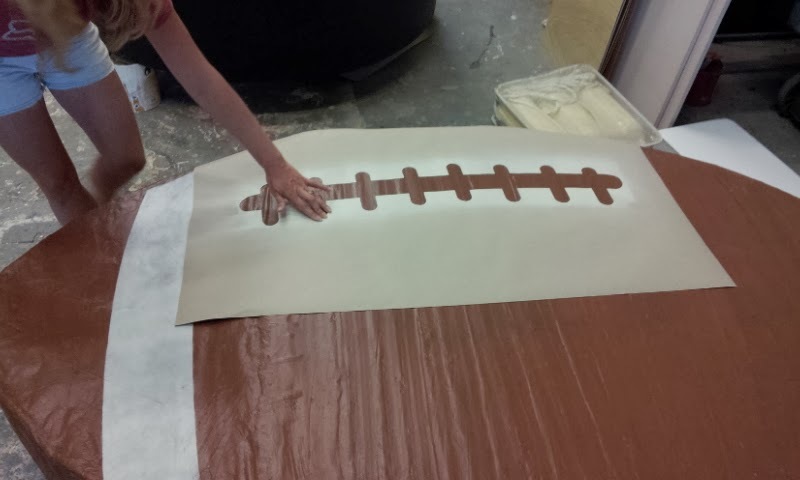 The hand painted look would come from using a brush to outline the sprayed portions. 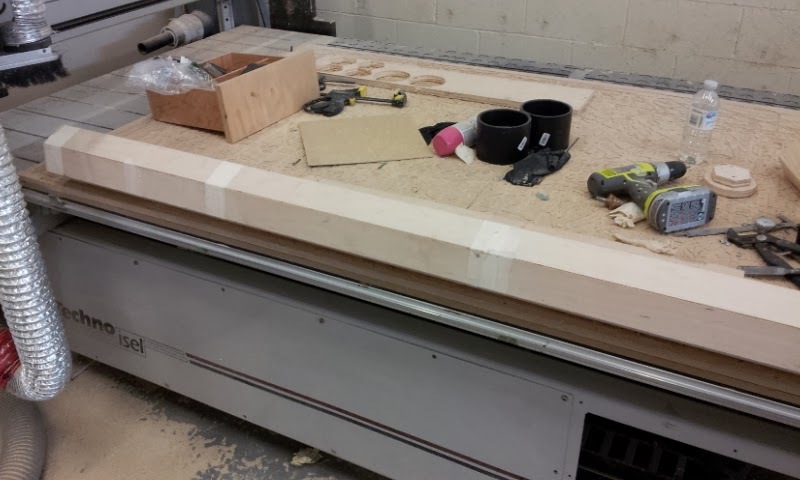 The pieces took up a huge amount of room in the shop. Even though it was crazy hot that evening, we ended up closing the door in the end, due to the on-onslaught of blood thirsty mosquitoes! 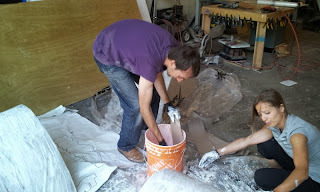 We had about 9 fans all running to dry the acrylic latex paints, which only had around an hour to dry before they got loaded into the cube van. I was glad to drop them off, and actually slept for a few hours in the rental truck before heading back to the shop. The entire pencil build was one of these times. Not the pencil itself, but that stupid metal band that holds the eraser on. I thought about using metal, I thought about engraving something on our Techno, but non of it seemed deadline friendly in the end. Most times we are lucky enough to be provided story boards for our portion of the job. These answer more questions than lengthy, back and forth emails ever could. Most times the boards are more help than meetings are as well! The story boards for us let us see how much of something we build will actually be in frame, or how tight the camera will be on it. Due to the size of the pencil in frame, high detail wasn't actually required on it. So with all the information available, I decided to go the route of printing. I drew the file up in corel, and sent it to our print house. The printed metal band came out great! 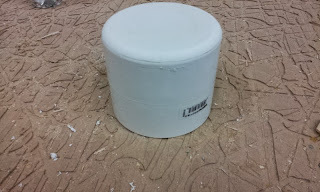 We stuck it to a piece of 1/16" styrene sheet, and would wrap it around the pencil. 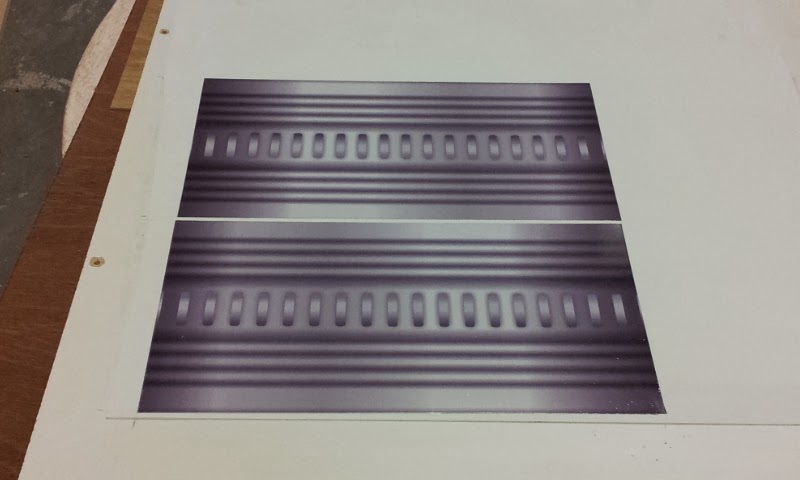 Plus, the design of the metal band left lots of hiding places for the 1/4" narrow crown staples that will be holding it to the rest of the pencil. The eraser tip was the least of the problems for this. I went with 2, 4" pvc pipe joiners, I glued on a flat plate of 1/2" white pvc, then routed the radius on with our hand router. With the pencil tip securely glued and screwed then shaped, I rounded the back end with the belt sander to aid in the wrapping of the printed metal band. Knowing that the pencil was being used as a baseball bat AND a battering ram, the next problem would be paint. 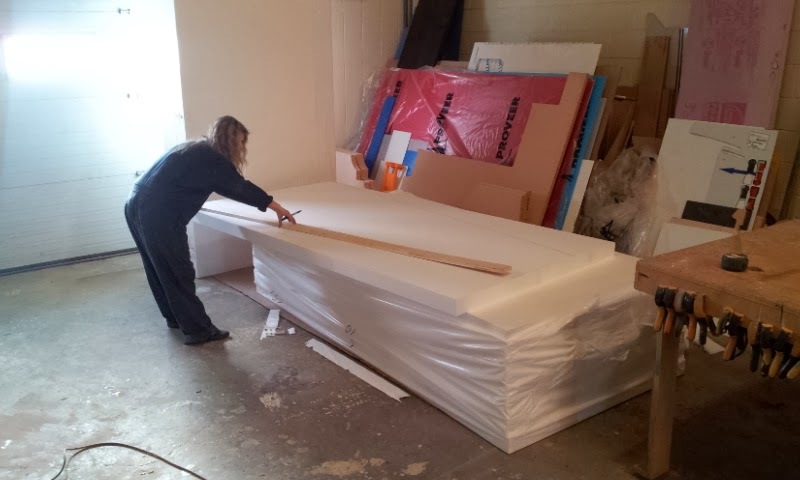 As friendly as acrylic latex is, it's not overly durable in rubbing situations. 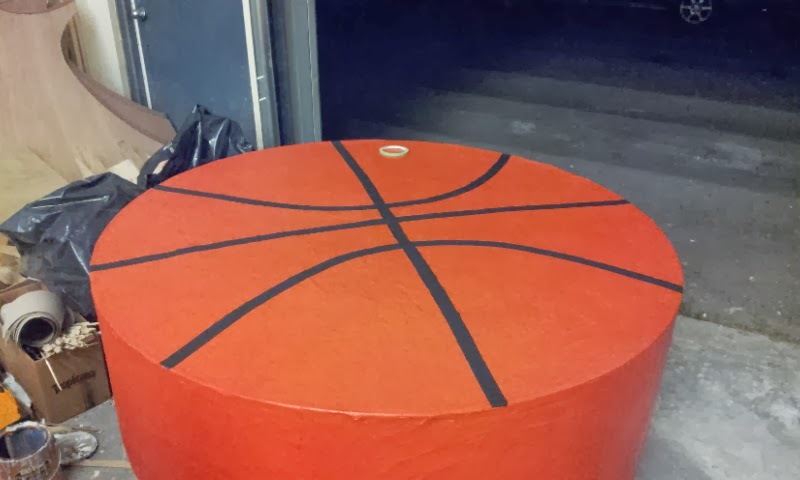 We decided to try a completely different water based paint for this. We went with a waterbased pavement marking paint. This paint is used for painting parking lot lines. 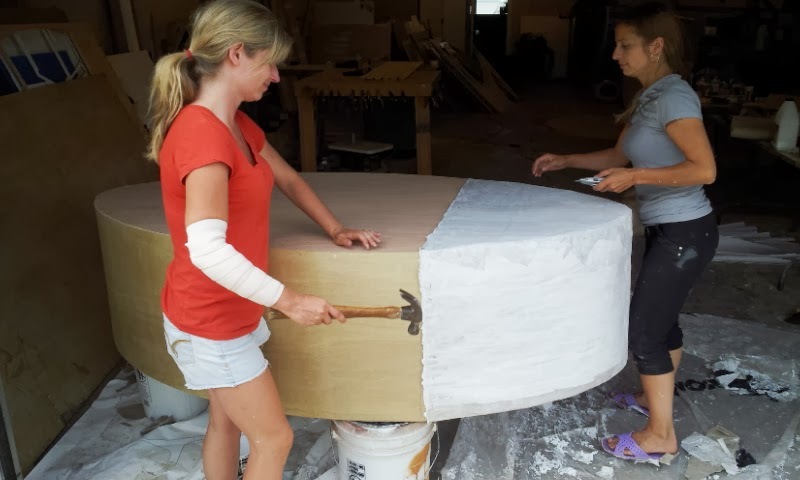 It has all the benefits of latex house paint, but you can actually feather sand it when it dries. It's really durable for water clean-up. 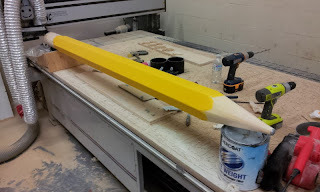 The bright yellow is the color from the can, and made an excellent primer sealer base coat for the wood. 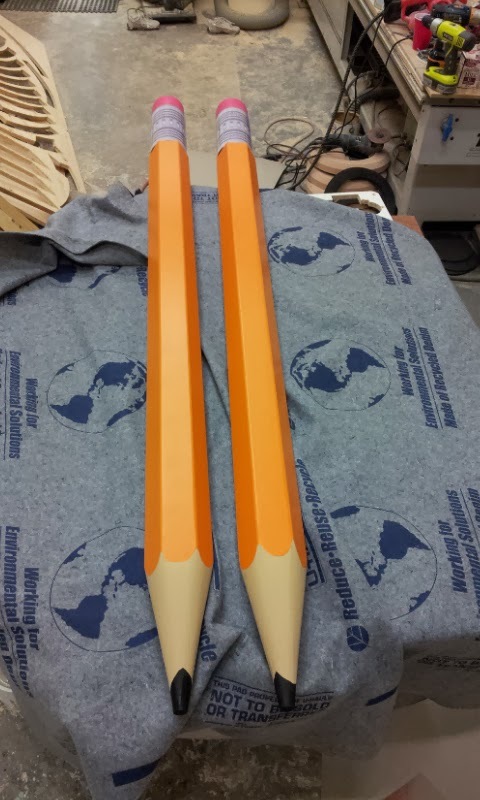 Jody matched the color to a pencil we had in the shop by further tinting the same paint to a more realistic color. With the final assembly done, all that was left on these was delivering them to set! 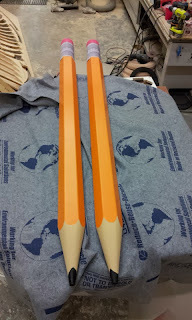 It was really hard not to want to put "OxenhamDesign.com" on the pencil where "Hilroy" was on the real pencil! But if the client was un-happy, it would be a big step backwards! With the cast sections for the breakaway football almost dried, they were slipped over the rigid portion of the football. We were pushing our luck with the dry time on these, but we managed to get them de-molded safely! We used a regular staple gun to tack the paper section to the framed wood section, then followed up with a quick trim, and nail set! 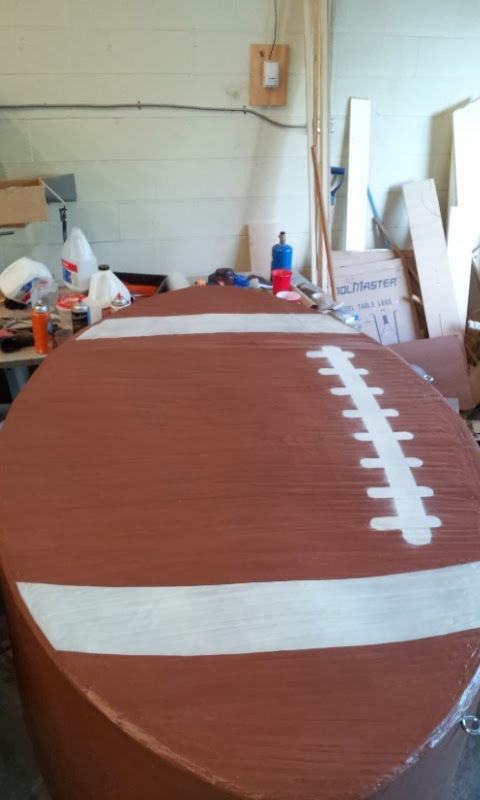 With the two halves mated into one piece, the next step was to cover the rigid portion of the football with paper mache, and blend the seam away. Again, the mighty drying powers of the sun were employed anywhere we could! 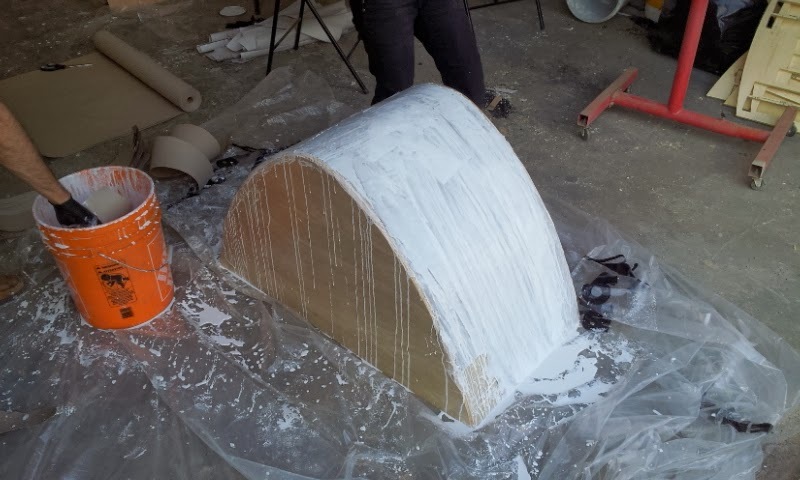 In the end, we also used some scenic mud to add additional texture to the props to further drive home the textured surface of paper mache. Jody and Anna got the base coats applied to all the oversized pinata's. 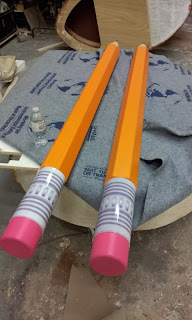 While the ladies were working on the paint portions, I started to tackle the 2 oversized pencils that would become the tool to smash open the pinata's. We decided on 2, in case something tragic happened on set, they would have a backup pencil to use. The diameter of the pencil was spec'd out at 5 inches. I thought about just using a cedar 6X6 milled to the shape, but it was impossible to find one that was light enough, and didn't have shrink cracks down the length of it. 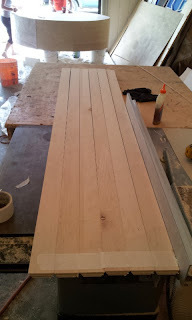 In the end, I went with 3/4" maple plywood, with each section mitered to the correct angle. Using masking tape as a hinge, the sections were rolled up, using a urethane glue and staples to complete the shape. Once the glue dried, we capped the ends, and poured measured amounts of casting resin down the inside, rolling the pencil to get the resin in every nook and cranny. A fair amount leaked out in places, but that's the exact reason for doing it. I wanted to fill every space on the seams with a quick hardening adhesive, adding the maximum strength possible. 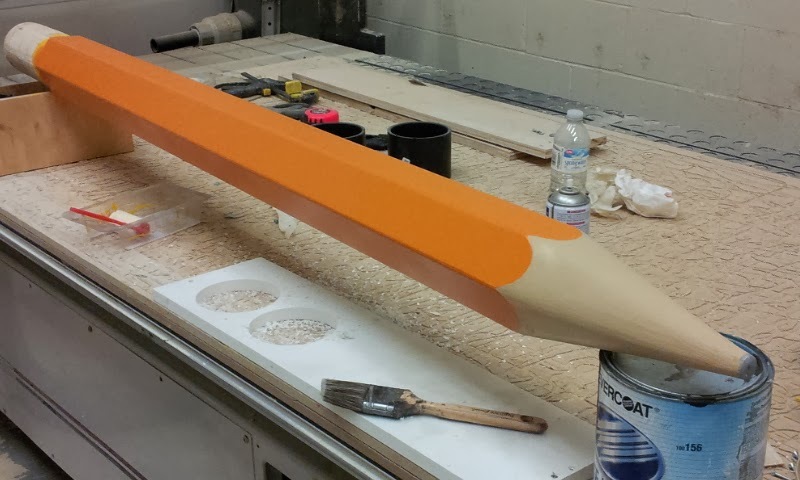 The tip of the pencil was fabricated from 2X4 pine stock. Again, these were 6 sections, compound mitered on the table saw. 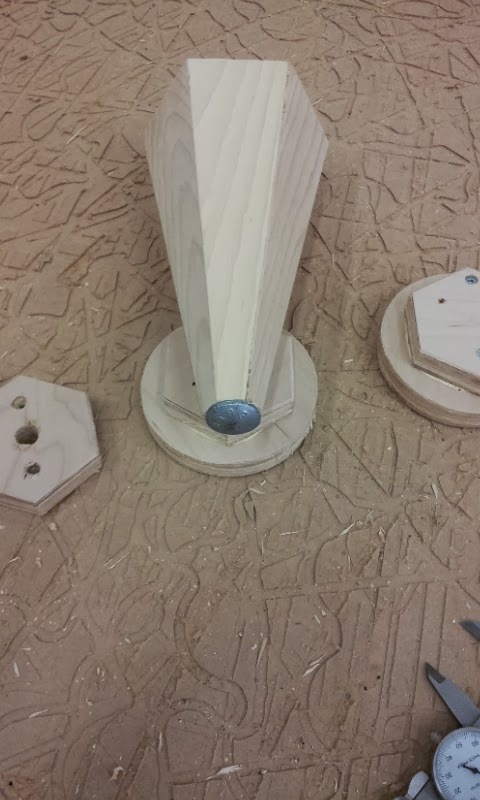 Once the glue and resin had set, I drilled straight down the tip for the 5/8" carriage bolt that will add the bulk of the strength by tying all the sections together. 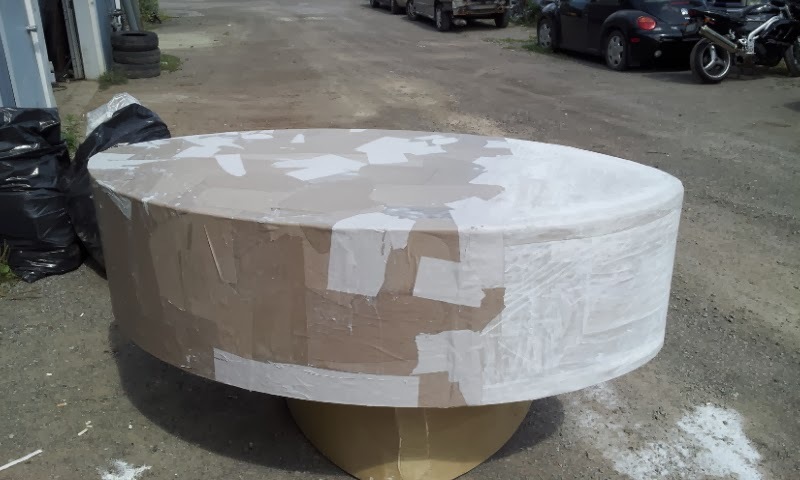 The rounded head of the carriage bolt would become the pillar of strength for when the pencil is used as a battering ram through several dry-walled set walls! Plus, when we paint it, it'll have the rounded tip of used pencil lead! The Summer with the Lottery! There hasn't been much awesome building here lately. We've been doing all computer work and design stuff. One of the jobs we did during the summer came with a signed NDA, so now that it has finally aired, I thought I would post the build! I haven't been able to find the commercial online, but I did see it on TV the other week. This was for Pro-Line sports lottery. The concept was that they wanted giant pinata's. One of them would be smashed open by a guy with a giant pencil, and a football player would fall out. Then they use the pencil to crash through a couple of walls, eventually getting to the counter to buy a proline ticket. There was a baseball, soccer ball, basket ball, and 3 footballs. The footballs would be the only ones that actually get busted open, the other ones just kinda hang there. 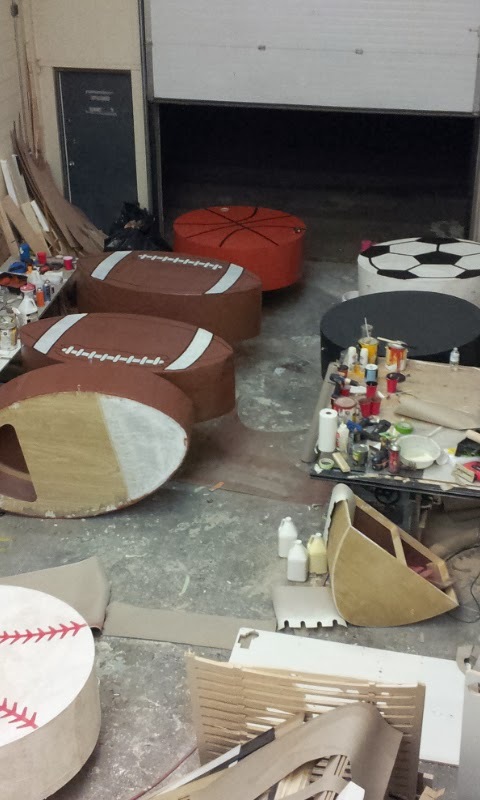 In fact, footballs 2 and 3 were just back-ups, in-case the first one didn't work very well. They didn't want these to be fully dimensional, just kind of extruded flats. The balls were 52" in diameter, and the footballs were 6 feet long. 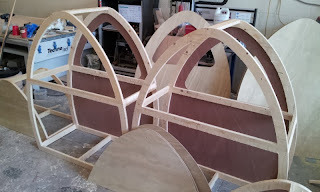 Due to their size, we opted to frame them out with plywood and 1/8" luan for skins. Very lightweight! 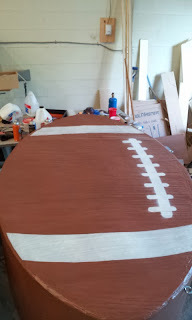 I had to solve the issue of how to have the footballs be framed in wood, AND bust open like a paper mache pinata. I finally decided that we would frame the part that gets smashed, and use it as a mold. 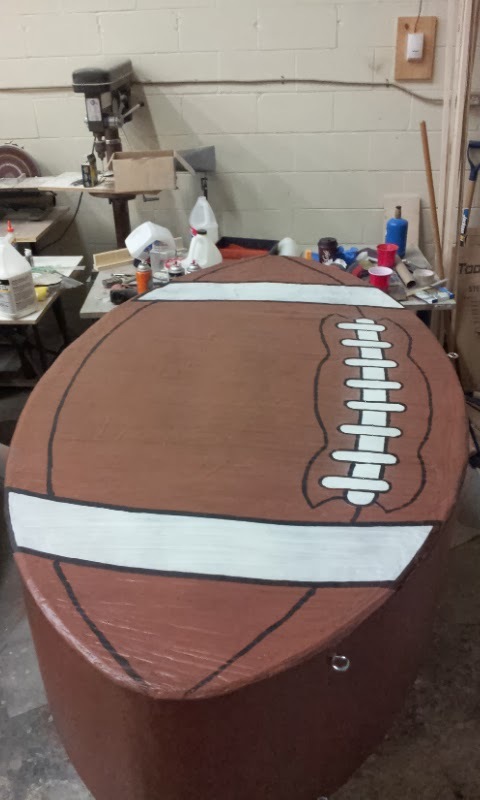 So I added a 3" overlap to the frame on the bottom of the football. When we finished the paper mache, it should slide over the upper part of the football by 3" becoming a strong glue joint. 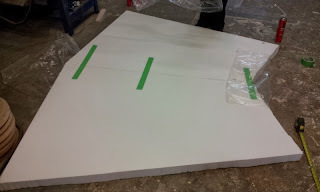 To start, we covered the bottom frame in poly-ethylene sheet, to aid in removing the final paper mache. The mache part was just a mixture of white glue and water. We also went with a thicker moving paper to bulk the skins up faster. It wasn't my most favorite part of the build, but the gooey strips went on fairly easy. 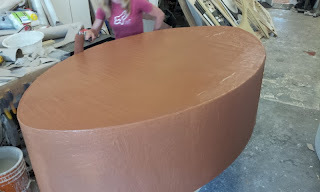 The hardest part was remembering how many layers we had added. If we didn't have enough, it could fall apart while de-molding, if we added too many, it'll never smash apart. 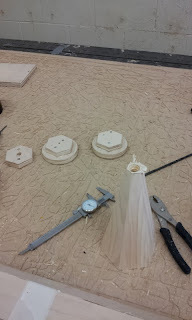 And there was no time to re-mold these pieces. This was another 3-day start to finish job. I have to organize and label the rest of the pics for posting tomorrow!